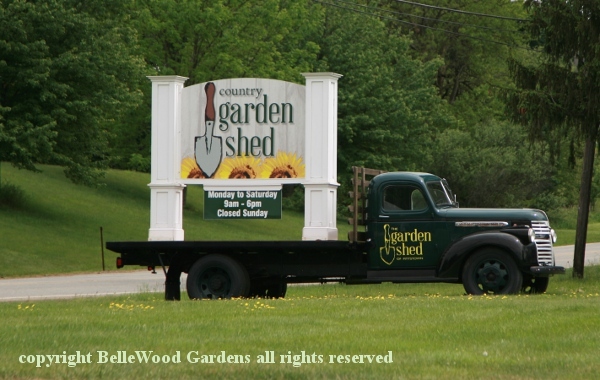 Any garden center or nursery, it never fails, has something of interest for me. 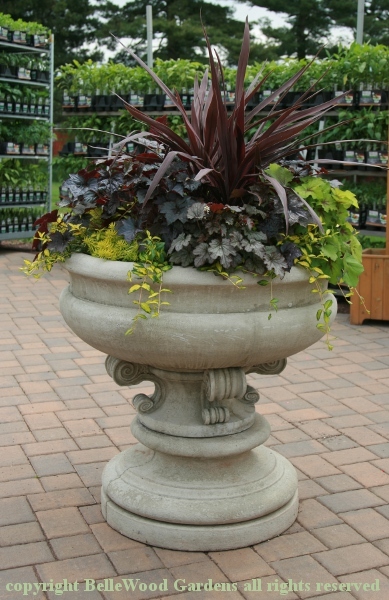 A plant, a combination of plants, flower pots, fertilizers, something. 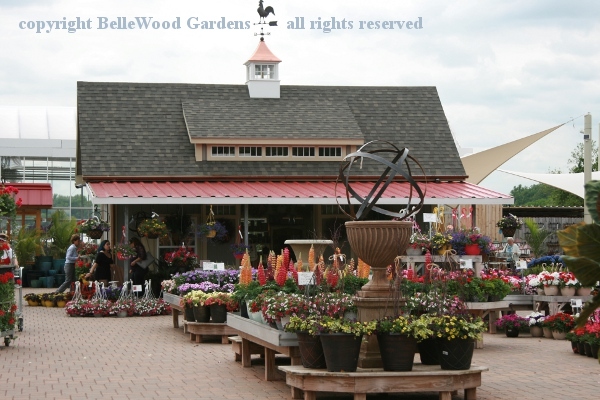 The difference between them is that garden centers buy in and sell out, while nurseries - at a minimum - grow on. The best also propagate. 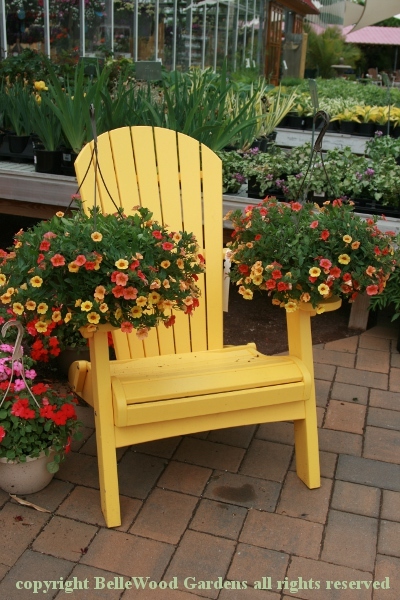 The big box stores, even supermarkets at this time of year, are selling much of a muchness: the "usual suspects" range of annuals, familiar perennials, some shrubs. Be catious about "familiar," as annuals and tender perennials for summer gardens have a way of falling out of favor. Abutilon disappeared a few years ago. This year it seems to be torenia that have vanished. Ah well. The thing to do is visit any and every nursery that I pass by because I never know what they might have to catch my attention. 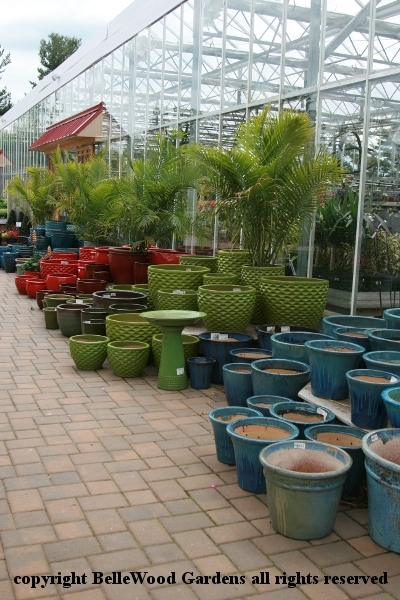 at their neat and tidy, very colorful garden center. in a range of sizes, complete with matching birdbaths. 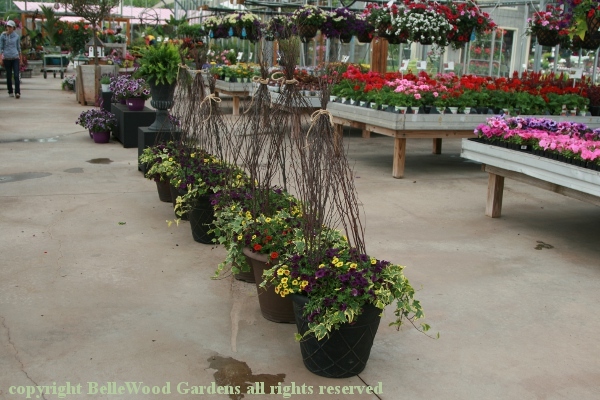 pre-planted pots with country-casual tuteurs of birch branches. 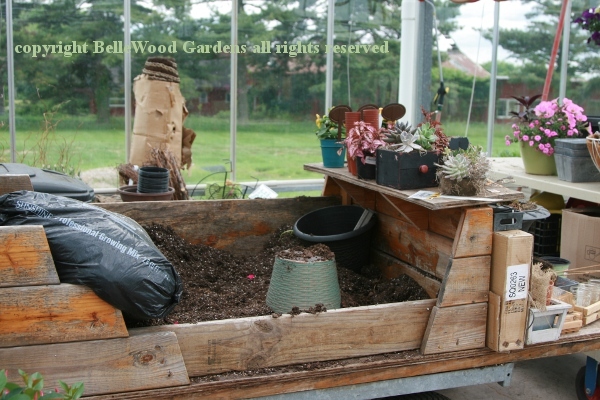 I admired their potting area. Every gardener could use one. the moment of perfection, to be lost as the plants grow and tangle. But no one would scoop them all up and plant just as we see it now. abundance of thriller / filler / spiller plants. 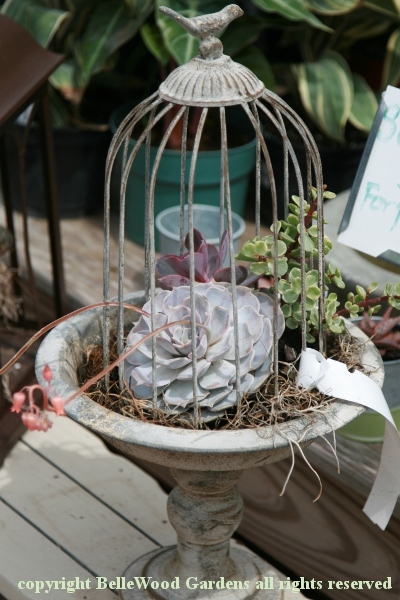 my attention turned to this caged echevaria. 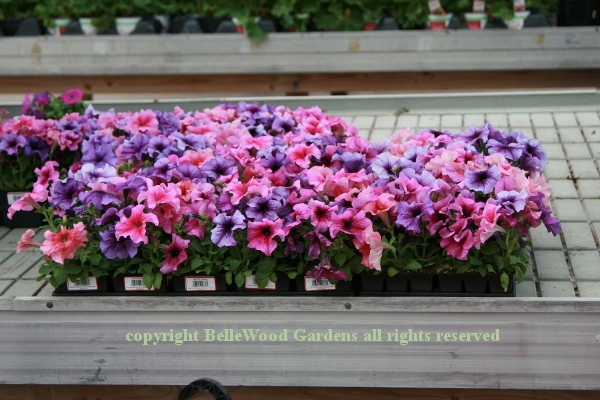 supports two baskets of vivid calibrachoa. 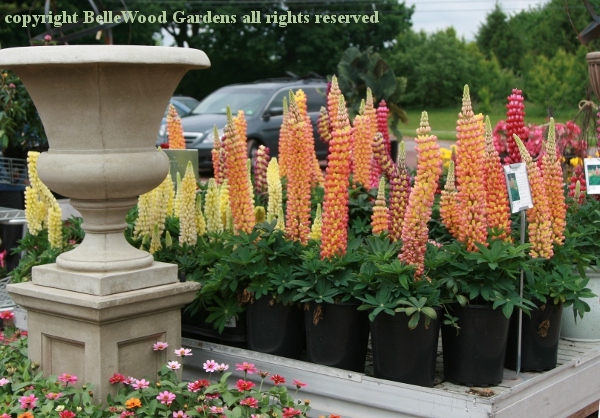 A bench of lupins in hues from yellow to peachy orange and red. 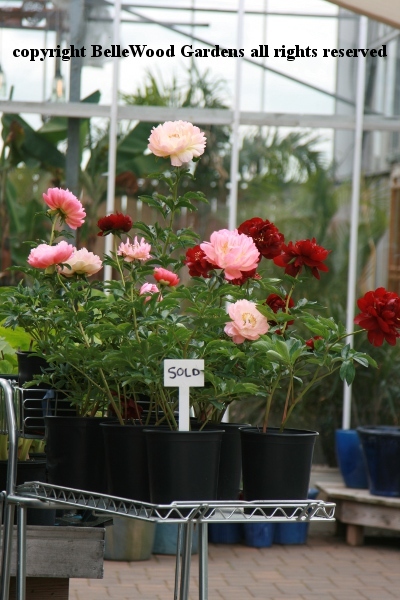 Some stunning peonies offered for sale. A prior customer must clearly agree. and keeping the benches replenished. Well done. There are some shrubs - I especially noticed mop head hydrangeas in billows of blue flowers. 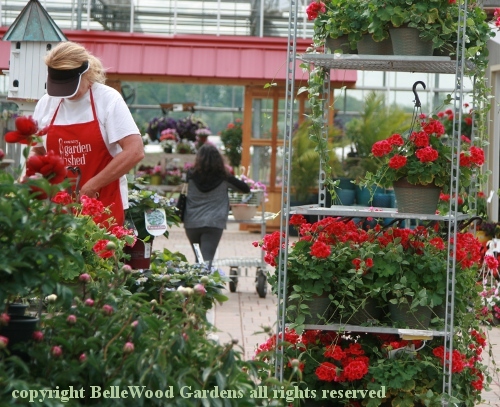 Perennials have a focus on what's in bloom now, such as the peonies, a good slection of heuchera with colorful foliage, ditto for hostas. I did not see any ferns, or abutilons, or torenia. But I did go home with a good sized Cordyline 'Red Star', a gray-purple sprawling sedum, Ajuga 'Chocolate Scallop', and three dwarf blue-leaved hosta. As I said, there's always something.